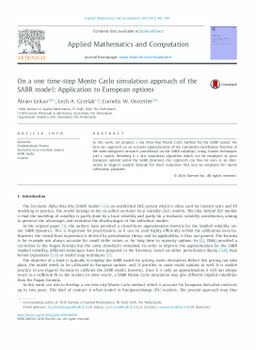 In this work, we propose a one time-step Monte Carlo method for the SABR model. We base our approach on an accurate approximation of the cumulative distribution function of the time-integrated variance (conditional on the SABR volatility), using Fourier techniques and a copula. Resulting is a fast simulation algorithm which can be employed to price European options under the SABR dynamics. Our approach can thus be seen as an alter- native to Hagan’s analytic formula for short maturities that may be employed for model calibration purposes.